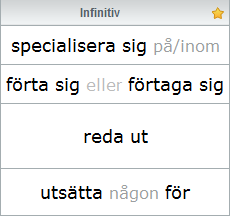 Svenska Verb: nu blir det roligt att böja! Programmet Svenska Verb är utvecklat för att hjälpa dig lära in olika verbformer i svenska språket. Det är väldigt enkelt att använda programmet – välj de inställningar du vill och skriv in i fälten de verbformer som fattas. Du kan välja ut verb enligt din språknivå, använda olika kolumner som tips, sortera verben på olika sätt och andra användbara saker. 2017-02-16: Verb databasen återställd efter attacken! På ryska Visa bara de verben som har översättning Inte alla verb har rysk översättning. Om den här optionen inte valt, då kommer engelsk översättnign att användas istället. Web-site restored after being hacked. If you experienced problems with using the program in the last few days - it was due to the fact that the web-site got attacked and the database with all the verbs destroyed. Now I restored the data, however, some corrections that were made earlier are now gone. I will try to find them and implement. Now you can select yourself which verbs you want to practice! Please read below about how to do it. I should thank Laura for some inspiration. Minor CSS issues in IE7 have been fixed. and then press Ctrl+F5 in your browser to refresh the page. As you see, now there is two tabs: "By level and group" and "Choose verbs". When the first tab is selected, you can see the standard option - a number of checkboxes, clicking on which gives you possibility to choose the verbs you want to practice according to their level and a group. Clicking on the "Choose verbs" tab allows you to choose the verbs you want to practice yourself. In the tab you can see the list of all the verbs. You can choose a verb to practice by clicking on it. You can sort this list by using the Show verbs drop-down. You can as well find a verb you need by using a Search box. To remove all the verbs that you selected click on the Unselect all verbs link. I hope these changes will make your experience of working with the program better. As always, I am asking you for your feedback, as this gives me a lot of inspiration and makes me keep this project running. You can always or leave a comment on this page. It became also possible to turn off/on the Presens, Preteritum and Supinum columns. If you don't see this update, please press Ctrl+F5 in your browser to refresh the page. Since there were many people who asked for the offline version of the program that you can download - I made one. Basically, it's a copy of this web-page which doesn't need the internet for work. This is a fully-functional version of the program that you can use without access to the internet. The only limitation is that the interface is only is swedish. But the translations of the verbs are still available in english and russian. As a developer, I suggest you to use any other browser - like Firefox, Opera, Chrome, Safari - except Internet Explorer. Not only for this web-site for your everyday surfing too. Please let me know if you experience some problems with it or something! Finally I did what should have been done long ago. Now all your personal settings will be saved even after refreshing the page. Hooray! The cookies in the browser must be turned on (usually they are). Your results will also be saved. The way the help tips are shown was a little bit improved. Remember: You can always go back to standard settings by clicking on "Default settings" button under "3. Choose mode" menu. I'm warning you that this new version of the program hasn't been tested too deep, so new bugs can come out. If you see them I'm asking you to or leave a comment on this page. As you might have noticed, few weeks ago I had to roll back this programme to its previous version after I had discovered (not without your help) major problems with browser compability. After some bug fixing I'm doing the second attempt to release the new version again. Hopefully it goes better this time. I also want to thank users mac and Xiaodi for finding misstakes and giving me some new ideas. 3. Choose mode > No hints in the settings menu. This mode is good for remembering new words. Try it out. No support of Internet Explorer 6. I made this decision. Upgrade your browser! You can still use the older version of the programme, if you like it better. Please let me know if you experience any problems using Svenska Verb programme. You can or leave a comment on this page. User Yas min emboldened me to do this update by helping with updating the verbs database, for which I'm really thankfull. I decided to combine level SAS A and SAS B into one SAS A+B, to simplify the settings and also because it's kind of tricky to decide in which level a certain verb belongs to. I decide it subjectively. Does it work fine on your computer? If not - what doesn't work? Is it easy to work with it? Is there anything that should be added there? Is there anything that should be changed?? Only with your help i can do something useful. That's why I ask you to or leave a comment on this page. Thanx for your support. Cheers. The new 2.0 version of the Svenska Verb program has been launched. Hurray! I'm glad to announce the release of the new updated version of the programme. The main task in preparing this release was to make the programme easy to understand, easy and comfortable to use. I tried to make the interface intuitive and added a number of useful features. I want to thank everyone who expressed their ideas about improving this program. I tried to take them all into account. Please, contact me if you have other good ideas..
Interface. All settings have been reorganized into three-step menu. Design. I attempted to refresh the look of the program, bring forward all the necessary functions and hide less important details. Selection of the fields: Now when you hide / add columns to the table - the table itself is not reloaded and the results of your work isn't getting lost. If mode selection (ie the column, which will be used as hint) - table also does not reload and the results are not lost. A new "Random" mode was added, in which the hint for each single verb is chosen at random. This is a very effective method of training verb conjugation. I recommend to use it. Now the focus remains on the same field, if you entered an incorrect value. Now there are special icons in the column headings. These icons have the functions of hiding the column or to use it as a hint. The interface translations were fixed. The news feed that you are reading now is opened. To make it possible to save your results and settings so you do not have to do it every time you visit the web-site. P.S. 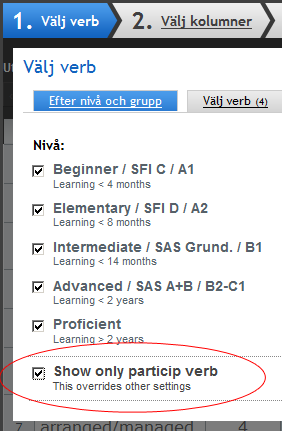 In the meantime, I finished the SAS B course and received MVG grade, which makes me very glad. The first full-fledged version of Svenska Verb 1.0. program has been launched! Today I launched the new version of the program Svenska Verbs. The design has been changed, the interface got improved, the functionality expanded. I hope it will help somebody with something. ..Meanwhile I passed the natioanl exam in swedish and got my deserved SFI D level. Which I wish to you too. Now you can comment here! So, today I finally launched this comment form so the potential visitors (like you) who might want to express themselves here are able to do it now. So if you want your opinion to be published above this one - just click the right link. And fill in the form. And then click the button. And then wait for about 1734ms longer. And only then, if nothing went wrong, you`ll have your comment published. This is how things work on the web. Or at least at my part of it.